Sweater: Goodnight Macaroon c/o (40% OFF!) | Shorts: Topshop | Booties: Jeffery Campbell | Sunglasses: Sold out similar here | Lipstick: MAC in "Brave" with this lipliner in "Mahogany"
Well, it's October 1st and I am still wearing shorts! But, I have to say we are getting some mild effects due to Hurricane Rosa and it has been cooling off. Praying everyone stays safe! 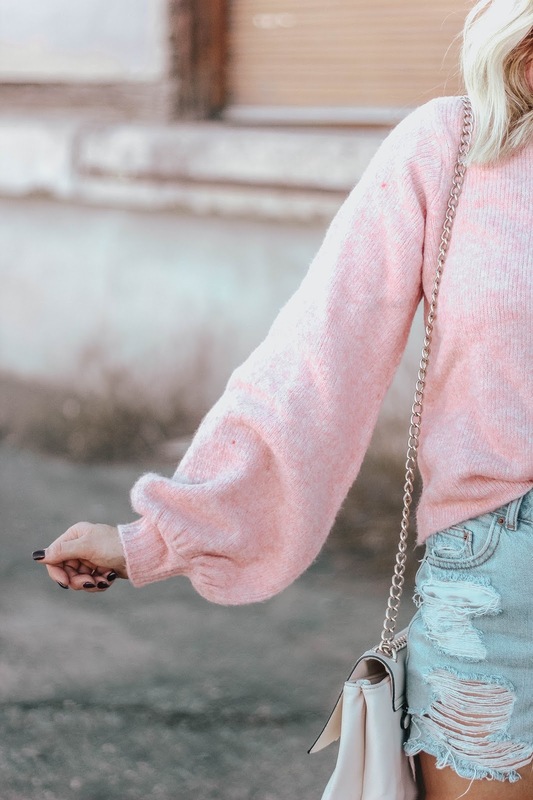 I shared this sweater in my Fall Must Have's post last week and here it is in pink. I am obsessed with it and the bubble sleeves! It comes in 4 different colors and currently 40% off with code COZY40 making it under $35. Seriously, such a deal for a darling sweater. The length is a bit shorter than a normal sweater, so it looks perfect with high waisted jeans (or shorts) or underneath a jumpsuit.